I'm looking for a specific kind of Ethernet 8-conductor data cable. I am having trouble finding them online (at CDW, Newegg) because I can't always come up with the right search terms. A search for "Flat Ethernet cable" usually gives me a bunch of nice looking "premium" and expensive cables which are targeted towards the home user/audiophiles, etc. These cables are typically used with a serial console. 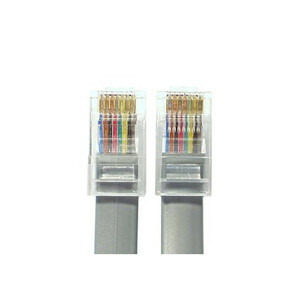 In a typical use, one of the RJ-45 jacks will connect to a RJ45-to-DB9 adapter, which then plugs into the serial port on the back of a machine. On older hardware, this may be a RJ45-DB25 adapter, etc. What are these called? Do these cables have a common name? Sysadmins usually assemble these on their own, but I'm looking to save time and buy them. RJ-45 connectors on each end. Flat (not round). No shielding, no twisted-pair, etc. These are NOT cat5e cables. These are intended for low data rates (9600 bps - 115200 bps ). These are low profile, very flexible and don't take up much room in the cable management system. This is important when dealing with 42 servers and potentially 150+ cables in a rack. 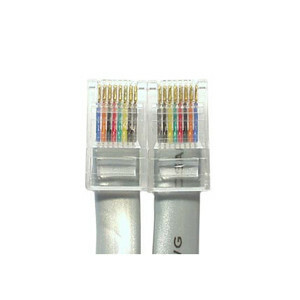 Sysadmins often use Ethernet cable instead of this cable, because Ethernet cables are available everywhere. These are similar to Cisco's light-blue rollover cables with a DB9 connector on one end. But I need some without the DB9 adapter. They are commonly known as "console cables" or Rollover cables. They are NOT Ethernet! They are often flat CAT3, or just 8 conductor ribbon cable. All console cables are null modem cables, it is just the pin out that is sometimes different. You'll sometimes hear the term "silver satin" cable (Crossed / Straight). Wiring is usually straight between a control item like a keyboard and controller. When the cable “loops” between multiple units it's usually inverted. flat conductor cables are not going to be the same as any other standard as far as resistance and general connectivity are concerned. Sure an 8 conductor cable has the same number of wires as a cat5e or cat6, but how the pairs twist is what is important on those cables as far as the signal is concerned. For small cables, it probably doesn't matter much, for long ones it really does. You might need to search at an electronics components store for that type of cable. If you're really concerned about cable management, there are solutions that are rack add-ons that are decent, but you're better off using waxed string and sticking with cat5e if you're going to be using them for service and not just console management. We called them "console cables" in Uni, I'm not sure if that's their official name. Not the answer you're looking for? Browse other questions tagged cable console-server or ask your own question. Recommended way to wire a serial port on a server? Why are serial console ports on network switches 8P8C/RJ45 sockets?